The Handliner is an interpretation of a craft very common in the Strait of Georgia around the 1930's. They were the "perfect boat" to fish for salmon off the beach in a subsistence fishery. My cedar strip version is built to lines taken from the Hubert Evans Handliner in the Sunshine Coast Museum. Fast and sea-worthy, it is fourteen feet in length by 48 inch beam, and weighs 90 lbs. 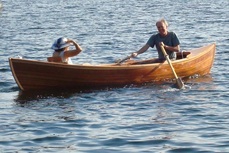 The Handliner is able to carry three, one oarsman and two passengers. Unlike the cosine wherry, the handliner is strictly a non-powered boat, although when working, a small sprit sail was usually fitted to them for down-wind use. The handliner can be commissioned for $4450.00 Canadian. Sailing fittings extra.